OK, this is 10 days late, but whatever. When was the last time the English test team was in such a good place? Having just won its first away test match since October 2016 - so long ago that the location, Chittagong, has now changed its name - they went on and won the other two test matches in the series to give England their first whitewash since beating New Zealand 2-0 at home in 2013, and their first whitewash away since beating Bangladesh in March 2010, a full 8 years before their success in Sri Lanka, Joe Root is finally starting to create the team in his image. It had been a difficult start to Joe Root's tenure as captaincy, having had to pick up from the overcautious Alastair Cook, whose bad decisions both on and off the field cost England dear two years ago against Bangladesh and India, it's somewhat fitting that the two biggest successes of Root's England captaincy tenure so far came against two subcontinental sides, India and Sri Lanka. What's more, the success extends further still. For the first time in a very long time, England have no bad selection problems, only "good" selection problems. After a disastrous showing in New Zealand when England lost 1-0, including being bowled out for 58, they had still yet to fix the three major gaps in their side, namely three batsmen. Jos Buttler's unexpectedly successful comeback, about which I was extremely sceptical given he had had two spells in the team already, solved one of those three problems. The second problem was solved in an unexpected way, albeit one I had been calling for for over 12 months, which is the inclusion of Ben Foakes. With Buttler coming back into the side and Jonny Bairstow's wicket keeping solid, there was no way for Foakesy to come into the side. Ironically, his keeping somewhat counted against him, as despite his decent batting record, he couldn't come into the side as it meant they would have had to take the gloves off Bairstow. An injury to Bairstow, therefore, brought Foakes into the side, he scored 107, and the rest is history. His keeping against Sri Lanka was nothing short of amazing, and he will have to do something majorly wrong to lose the gloves and his place in the side. So that's two problems solved for England, but what about the big one, the openers? England have not had a consistent opening partnership since 2012 and the retirement of Andrew Strauss. Alastair Cook's sudden retirement in the summer arguably didn't help, but after trying everyone and their mothers in the #2 slot, England have now, several years overdue, turned to Rory Burns of Surrey as the next cab off the rank. His technique may be unorthodox, and he is much better against pace than against spin, but in a low-scoring series against Sri Lanka he certainly held his own, whilst Keaton Jennings, under fire after being found wanting against South Africa and India in consecutive summers, told the world he was worth persisting with after a match-winning 146 not out in Galle. But I said that England do have good selection problems, and they're all in the spin department (Atherton, 2019). The more things change, the more they stay the same. Despite playing 55 test matches, the jury is still very much out on Moeen Ali. I'll stick to my view all day, that he's a utility player, the sort that wins you T20 games but doesn't win you anything in test cricket. He bats a bit, he bowls a bit, but on neither metric is he particularly exceptional in his own right. As often happens with Ben Stokes, if Ali were able to play as a specialist batsman only, would he be picked? Probably not. And as England's sole spinner, his record, a bowling average of 37.44, is not eye-catching by any means. The only real question mark is who plays as England's spinner (if the pitch is a one-spinner pitch). The alternatives are Jack Leach of Somerset, who played four tests last year, and was controversially relegated behind the other option, Adil Rashid, in the summer, who had "retired" from red-ball cricket until Ed Smith persuaded him to return to tests. At the time, I agreed with Michael Atherton's viewpoint, which was regardless of this decision to bring in a player not playing county cricket, it was an indictment on the English county game that Ed Smith did not believe that Jack Leach and Dom Bess regularly churning out wicket after wicket for Somerset was enough to get a test spot. Yet, despite a 5-fer in the last test match, Rashid looks certain to miss out. Who would I pick? Jack Leach. Moeen Ali's away record is nothing short of terrible, and Jack Leach's First Class (and indeed Test Match) record is far better than any of England's spinners. He is also significantly less expensive than any of the other spinners, meaning that he is a better option on a flat track to try to dry up one end. How about the West Indies? 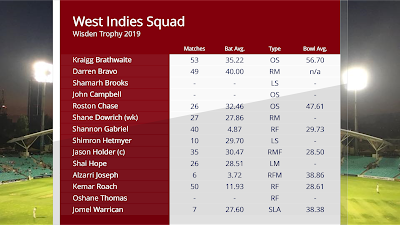 Their squad looks quite threadbare, lacking in an out-and-out opening batsman for a start, unless Darren Bravo opens the batting. The omission of Blackwood, K Hope, and Powell is somewhat surprising, and the lack of Bishoo indicates the pitch in Barbados at least won't turn as much as some expect it to, which is probably an overreaction to England's success in Sri Lanka. It's hard to look past another England whitewash, really. West Indies, after all, have only won the Wisden Trophy once this millennium, in 2009, against an England in all sorts of turmoil. But the Windies do have one trick up their sleeve, in the form of Shannon Gabriel. 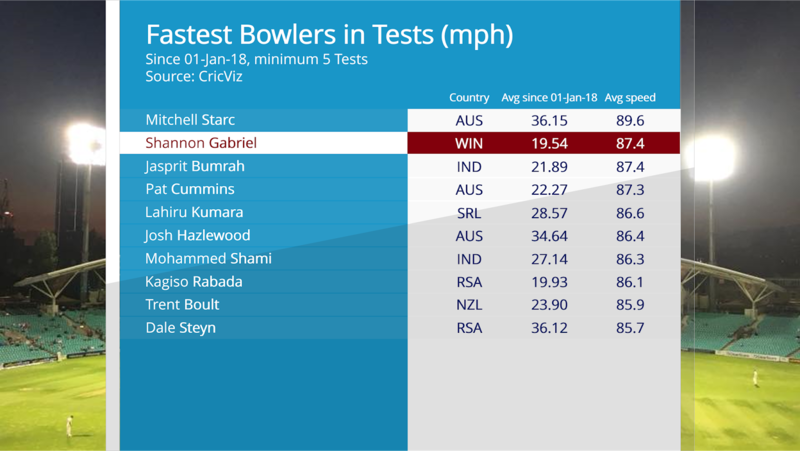 Shannon Gabriel is the second-fastest bowler in the world and one of only two in the top ten, along with Kagiso Rabada, to average under 20 since the start of 2018. Shannon Gabriel is probably the Windies' only chance of winning a test if he can blast out the English batsmen. I have always said pace isn't everything and that you need to be accurate too. 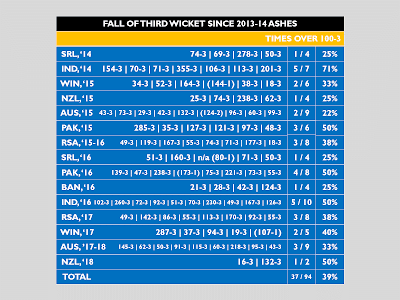 His average backs this up, compared to Mitchell Starc's horrid year despite being quick. The Windian batting has to be the biggest flaw for them. Only four players in their squad average over 30 in tests, and playing with a Duke ball in this series will surely play into the hands of the English bowlers. James Anderson and Ben Stokes swung the ball around corners when the West Indies toured England in 2017, and with the banana-like swing of Sam Curran you have to say that if the West Indies have any chance, they need to practise against swing bowling. If England can overcome Shannon Gabriel they will win the series easily, because their bowling is just too good. Even if Gabriel rips through England, the West Indian batsmen will not be able to get enough runs on the board for the West Indies to put up a major threat. I predict 2-0 or 3-0 to England (because you can never be sure about the weather). The 2019 F1 Driver Market - Ocon out of F1!? A week is a very long time in Formula One. Daniel Ricciardo, who was out of contract with Red Bull at the end of 2018, has moved from "the contract for 2019 with Red Bull will be signed at the Hungarian Grand Prix" to "the contract will be signed in the summer break" to "sod it, I'm out". What is happening now is anyone's guess. But first and foremost on the lips of most people is a very simple question: why is Ricciardo leaving Red Bull? For a start, Red Bull have been incredibly unlucky this year. The most unreliable team on the grid in 2018, they have squandered the chances afforded to them to the extent that they have thrown away a chance of challenging for the world championship. Furthermore, they have regularly been the 3rd-fastest team on the grid, and this may be artificially inflated by the two drivers, Ricciardo and Verstappen, who are very fast and may be potentially addressing the shortcomings of the car. Let us also remember that in Azerbaijan, Renault, who have the same engine as Red Bull (and thanks to a new-for-2018 regulation, neither side has a newer-spec engine), were easily racing the Red Bulls in the first few laps after the restart. Until Hulkenberg threw it in the wall and Sainz ran out of tyre life. Azerbaijan marked a watershed moment for Daniel Ricciardo. Max Verstappen got his elbows out in the race and the consensus was he was probably too aggressive. Verstappen regularly put the car in a position where if Ricciardo had not yielded they would have both retired. Then when Ricciardo finally did overtake him, Red Bull gave Verstappen a better strategy by leaving him out one lap longer, putting VES back ahead of RIC. On Lap 40, the two collided when Ricciardo attempted to go down the inside. Not only did the team throw away a solid haul of 22 points, but Verstappen's actions throughout the race were heavily criticised. In my house, however, we all laid the blame at Ricciardo. He was way too late on the brakes. But for most others, Niki Lauda included, Verstappen's infamous habit of moving in the braking zone caused the incident. Racers need to appreciate the difference between hard but fair and overstepping the line. Senna on Prost at Germany 1991 was hard but fair. Verstappen bumping and grinding his way past Daniel Ricciardo all day in Azerbaijan was overstepping the line. Having slogged for 30+ laps to overtake him and then only to find Max back in front of him, how demoralised must Ricciardo have felt? A race where they were no quicker than the two Renaults, a race where Verstappen appeared to have been given preferential treatment to him, and a race where he ended up walking back to the pit lane. For Ricciardo, that may have been a message: this will not do at all. Reliability has been the biggest issue for Red Bull for this season. They are the most unreliable team on the grid. Christian Horner always lays the blame at "Squirrel Irritable" and his Renault engines, but these are the same engines that have had no problems at Renault and McLaren this season (although McLaren's gearbox has let them down on several occasions, they are one of the most reliable teams on the grid). Just read the list of retirements - Bahrain: double retirement when Red Bull looked like they could win the race in Ricciardo's car after Verstappen binned it in qualifying. Azerbaijan: double retirement after crashing. Austria: exhaust failure for Ricciardo. United Kingdom: brake failure for Verstappen. Germany: Ricciardo forced to take engine penalties, then suffered power failure with a brand new engine on Lap 27. Hungary: turbo failure for Verstappen. Throw in some bad luck and some questionable strategy calls in Hungary's qualifying session and Red Bull, not for the first time, made Ricciardo's weekend exceedingly difficult. Following on from that, next year the team will be switching to Honda engines, which have been incredibly variable between "OK" (2016, 2018) and "terrible" (2015, 2017). Is it one big gamble for Ricciardo to stay at Red Bull? Quite possibly. The improvement at Renault has been impressive, he knows what he'll get with Renault power, and he may be able to drag Renault into the top 3 in 2019. The addition of number one status (which he only ever had for 23 races at Red Bull) will aid his cause too. But what does this mean for the driver market? It was thought that Esteban Ocon was taking the place of Carlos Sainz at Renault for 2019. And the near certainty of Lance Stroll going to Force India leaves the market looking very short shrift for several drivers. There appear to be three major developments on the circuit surrounding the three engine manufacturers and their young drivers. Esteban Ocon, a Mercedes junior driver, is currently at Force India but it looks as though there's no avenue for him there. The only option is therefore to move to Williams, but this has never been suggested. At Williams, Sergey Sirotkin looks certain to retain his place with the Grove outfit, and the question of who moves into the second Williams seat is hotly contested. It has been suggested that Mercedes want to put George Russell in the second Williams, but with Ocon now back in the dole queue, what does this mean for Russell? And Pascal Wehrlein, who appears to have been forgotten about completely after Sauber's move to closer links with Ferrari gave Mercedes' Wehrlein short shrift? This is the first piece of the puzzle: Mercedes' test driver looks likeliest for Ocon now, with Russell taking the second Williams seat. The only other alternative is to cast Sergio Perez out of Force India in favour of Stroll and Ocon, but I would be very surprised if this were to happen since it is Sergio Perez who has saved the team from a winding-up petition. The second question is the Carlos Sainz question. Red Bull now have to choose between Frenchman Pierre Gasly or Carlos Sainz for promotion to the main Red Bull team. Sainz's contract with Red Bull (and Toro Rosso) will expire in September if Red Bull do not "recall" him from his loan at Renault into the main Red Bull outfit. Sainz is a very fast driver and was certainly very good in 2015. However, it is thought that Sainz and Verstappen did not get on at Toro Rosso and this is the main stumbling block. Carlos Sainz is a very good driver, make no mistake about it. The decision is in Red Bull's hands. They managed to just about keep a lid on the Vettel/Webber rivalry, so this is probably what they ought to do. They shouldn't bend over backwards for Verstappen. Gasly has shown flashes of speed in 2018, but in my honest opinion it's not enough to be promoted. Since Red Bull haven't signed a driver from outside the Red Bull academy since they signed Mark Webber in 2007, it would surprise me if they were to look elsewhere. If they do choose Gasly, the driver market becomes far easier. It was thought that Sainz was on his way to McLaren to replace Stoffel Vandoorne, leaving Fernando Alonso with the decision as to whether he leaves McLaren (and F1) or retains his place with protégé Sainz in the second McLaren. Further complicating matters is McLaren's Lando Norris, who is thought to be incredibly fast but could well be poached by Red Bull if things don't turn out. Lando Norris could well end up in the second Toro Rosso. A Sainz promotion, however, would leave McLaren almost inevitably taking Lando Norris into the second seat. Sainz holds the key to McLaren's relationship with Lando Norris. The final piece of the puzzle is very much unrelated to this fiasco, but is related to the untimely death of Ferrari's Sergio Marchionne. Marchionne wanted to put Sauber's Charles Leclerc in the second Ferrari seat to replace Kimi Raikkonen, but Marchionne's death has potentially forced Ferrari to play it straight and keep things as they are. This is not to say that they will retain Raikkonen for sure, but it looks much more likelier than it did before the German Grand Prix. If they do promote Leclerc, Raikkonen's career in Formula One would come down to a shootout with the underwhelming Antonio Giovinazzi for the second Sauber seat. I'm not a big fan of Giovinazzi (nor Ericsson) and so I'd be putting Kimi back in the Sauber. - Toro Rosso: will Hartley be sacked? (Yes.) And who would come in for him? If Sainz is promoted, Daniel Ticktum. If not, Lando Norris. Why are we even surprised that the England cricket test team is a mess? The debacle of the Ashes, a lack of tough action, and now the test side looks toothless and a last resort of England. Only now are we suffering a delayed reaction to the huge mistakes made by Peter Moores in 2014, England's annus horriblis, to the stage where almost every England player bar two (Root and Anderson) should be under threat and looking at the competition. What competition, though? It's a fair comment made by Bob Willis on Sky Sports this week. The England Lions have just lost 3-0 in the West Indies, and such is England's obsession with white ball cricket after their embarrassing performance at the 2015 World Cup that the County Championship has been relegated to a sideshow. It is probably, on balance, a good idea to stop players changing formats so often, but to only have one Championship match between the last week of June and the third week of August is not ideal. The sheer amount of draws in 2017 (66 draws in 126 matches) indicates how fickle the English weather can be in April, May, and September. The spin bowlers in particular are going to find it ridiculously tough. England have a tour to Sri Lanka in October; we're just going to see another repeat of the disasters of India in 2016. Only SIX - SIX - English spin bowlers took 20 wickets in the 2017 Championship, and two of those played on the infamous dust bowls of Taunton. So, with the help of our computer graphics, let's dissect all 16 players in the current England squad. I have never been Moeen Ali's biggest fan, but this winter he's been even worse than he was in 2016-17. Throwing him in at the deep in in 2014 can't have been good for his development, and we can't turn back time now. With Ali, England are paying the price for mismanaging him. In 2014, I agree with Michael Vaughan's view that we required Gareth Batty as a stop-gap, and two spinners in the team, the second being Ali. This allows Ali to develop at international level whilst relying on Gareth Batty for the team's #1. That was four years ago. Ali looks nowhere near like a test match spin bowler. His batting's gone down the drain too. What does this man have to do to get dropped!? Two years' worth of Taunton dust bowls have given him a spot in the England side, although I personally prefer his spin partner, Dom Bess. He had some very poor performances for the England Lions and went at 10 per over in a tour game in December. I'm not hopeful, but either he plays, or we use Root as the main spinner. Don't use Ali, for Christ's sake. It's not as though England are home-track bullies, for 2017 was the first time since 2013 they had won both of their home series (having lost 1-0 to Sri Lanka in 2014, drawn 1-1 against New Zealand in 2015, and drawn 2-2 against Pakistan in 2016). England aren't dominating at home, and aren't winning away. Why is everyone shocked at England's atrocious performance in being bowled out for 58? 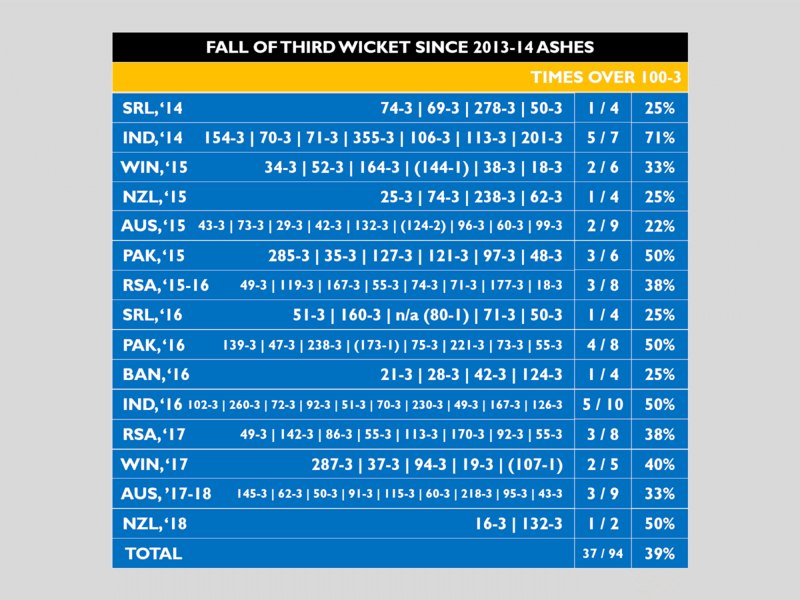 England have been 3 down for under 100 in over 60% of innings since the 2013-14 Ashes, and this time Bairstow, Stokes, and Ali couldn't save them - and to be fair, we should not be relying on 6, 7, and 8 every time. Feast or famine? Cook scored two double hundreds in 2017 but there is one major problem in that he seems to be getting better coaching at Essex than he is at England. You can see this in his trigger movements. When he is in form, his back leg moves across the stumps, followed by the front leg, followed by a solid forward stride, the bat in line with the pad, and block. When he is not in form, his back leg doesn't move across, it lands in exactly the same place. This puts him out of position and not with enough forward motion, resulting in one of two things: either he doesn't know where his off stump is, or he feels as though he's doing everything right when he isn't. Cook's problems are the really the fault of the batting coach, Mark Ramprakash. Even when a poor shot hits the middle of the bat and goes through the covers for four, I begin to fear for Cook's innings. He really has one more chance in Hamilton before England have to get firm with him. has found various ways of getting out. Nine tests in, and the jury is still out on him. He is yet another player who England have picked as a one-season wonder because they want form players rather than consistently good ones, a policy I have always disagreed with. 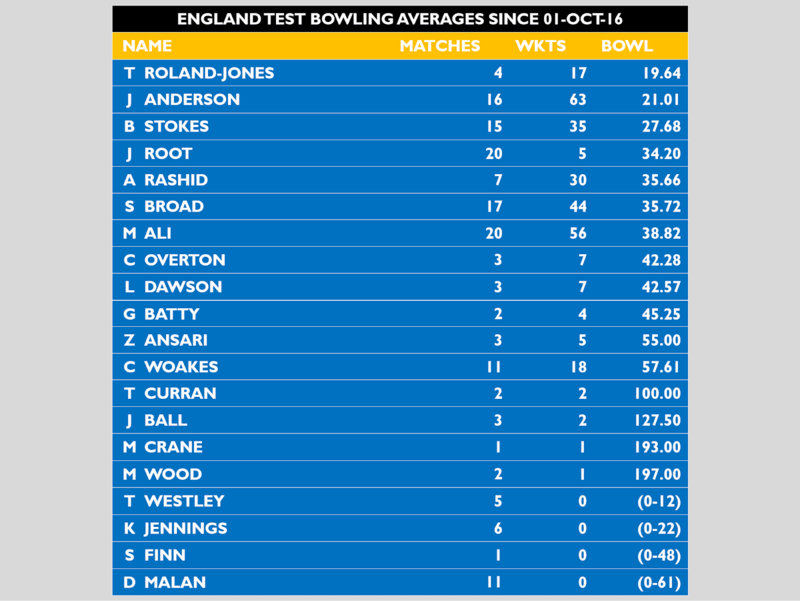 England selectors, for me, should look at the aggregates of players over the last two or three years. Yes, occasionally this method will give us some duds such as Gary Ballance, but it won't give us one-hit wonders like Ben Duckett, Haseeb Hameed, and Keaton Jennings. Where on earth are the likes of Ned Gubbins and Rory Burns, scoring runs year in, year out? In my opinion, England should have stuck with the promising Alex Hales at 2, but it's too late now as he's effectively retired from red-ball cricket. is one of only two players whose spot is not up for debate. His conversion rate has been criticised, but I'd much rather have a player who scored 50 in each innings rather than a player who scores 250 followed by 4 ducks. The way he came into the England side is ridiculous (scoring 77 in a T20 match) but after playing so well in Australia he looked like a walking wicket in Auckland. Even in the second innings, his feet were catching on the crease and it was almost a question of when, not if, he was dismissed. I've said it before, but if he gets in the England test side based on white ball performances, why hasn't Jason Roy? Malan's performances in the Ashes save him for now, but in Hamilton, if he has another shocker, he has to go. England need to be more ruthless, as per their successful 50-over side. The day this bloke does not edge behind off a wide half-volley with no feet is a day we can celebrate. For now, even when he scores runs, Vince's shots look incredibly wayward, just as I said with Alastair Cook. He should not be anywhere near the test team. Full stop. The obsession with "play your natural game" must end. Too often Bairstow has played stupid shots when the match situation requires a more defensive mindset. If Bairstow is unwilling to change then he needs a severe telling-off, or to be moved around in the order depending on the match situation. If England are trying to save a game, don't, for the love of God, put him in during a collapse. Verdict: Keep, but must try harder: B+. England see this man as a specialist gloveman, and his wicket keeping is certainly impressive, but his batting is no slouch either. He averages 41.34 in First Class cricket. And that's from quite a large sample size of 78 first class matches. That average is higher than everyone bar Livingstone, Bairstow, Cook, and Root. The only problem is picking him and Bairstow will inevitably give Foakes the gloves, and whilst Bairstow's not been bad behind the stumps, surely if we are in such a position we go for the best gloveman on the day? He simply must play in Hamilton. Ben Stokes is, or should be, at least, England's third seam bowler. His performances are very good with the ball and he is a genuine all-rounder in the likes of Flintoff or Botham. 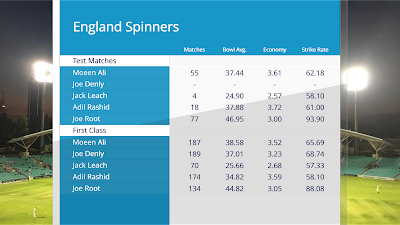 If England can find an answer to their spin issues, then we need only use Stokes, Broad, Anderson, and one spinner; allowing for seven specialist batsmen. Is Stokes good enough to be a specialist batsman? Probably not. If he's not fit for Hamilton, I would have said not to pick him, but he performed fairly well in Auckland, except for a very tardy shot to get out in the second innings and a poor back lift which contributed to his first-innings dismissal (he was the only one of the top order who thought to get down the pitch to counteract the swing). Verdict (specialist batsman): Last chance: B. 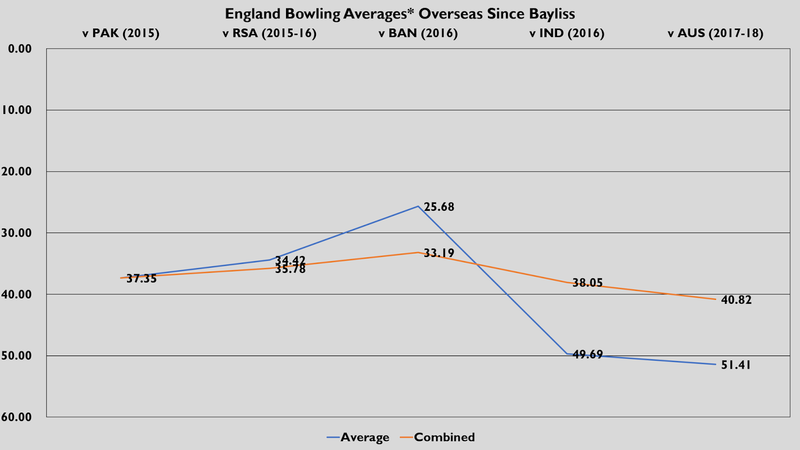 That 2-2 series against Pakistan in 2016 is a watershed moment for many of England's players, for many bowlers haven't performed since then despite appearances in all conditions - Bangladesh, India, England, Australia, and New Zealand. Since 1 October 2016, averages 57.61 with the ball. That is simply not good enough for 11 games. Get rid of him. 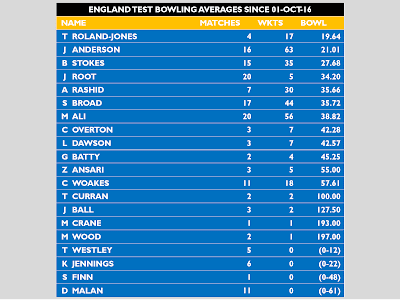 Toby Roland-Jones should be fit by now, bring him in for Woakes as the "dry seamer" option. I have talked about Mark Wood before. England's obsession with him because he can bowl slightly quicker (never mind the fact he bowls absolute pies) is ridiculous. If we want someone who "offers something different", etc, etc, why not Stuart Meaker, the fastest ever bowler at the England performance academy? Because he's utter crap. One of only two members of the team whose spots are safe. Bowling very well both at home and away. He did his job in the Ashes, taking 17 wickets out of a possible 80, but no one else did. Another "military medium pacer" who, like Darren Stevens, can get you a bundle of wickets in English conditions but is absolutely useless away from home. Worth trying at home at some point, but not in place of Toby Roland-Jones, who appears to have been forgotten about entirely. Verdict: Get rid, but revisit in the future. C.
On that basis, the England XI for the second test match should be bold, daring, and brutal: Cook, Stoneman, Root, Malan, Bairstow, Stokes, Foakes, Broad, Wood, Leach, Anderson. Liam Livingstone could play in place of Leach if we want no spinners. I really can't think of a good introduction for this post. It's a very contentious topic, certainly, and it has led to consequences far beyond what I could have thought possible. In the interim, I suppose I can plug my appearance on BBC Radio 5 Live on 22 Feb 2017 (on the "Drive" program, at 5:07pm onwards), where I answered a couple of points made by Professor Catherine Pope of Southampton University. But let's crack on with it. Firstly, I do sympathise with the lecturers and agree that the UUK's proposal is a bit iffy. But there are several major problems I have with the strike action. The tuition of students (which we have actually paid for in advance, don't forget) is being withheld and causing not only a strong legal case that a service has not been provided for which one has paid (a viewpoint shared by Universities minister Sam Gyimah: "I expect all universities affected to make clear that any money not paid to lecturers - as a consequence of strike action - will go towards student benefit including compensation"). I am losing just under 10% of my contact hours for the entire semester, and I've emerged relatively unscathed: some people are unlucky enough to be losing 25% of their entire tuition for the semester. Final year students in particular are being made to feel the pressures of the few lecturers. Universities have either dumbed down their degrees or students may not be able to graduate. I myself have an assessed presentation (which is still going ahead), but no lecture to base it on (as everyone else does). Sally Hunt has claimed that if the dispute isn't resolved, the next round of strikes will be in exam periods. Is this really what UCU thinks of students? That our degrees are worthless? It's always disheartening to see my university in the newspapers (both print and online) for all the wrong reasons. And whilst, to their credit, lecturers, or at least the ones I have seen, have striked (struck?) peacefully, militant students, who claim to be acting in support of the strikers, have run amok on campus, and they don't seem to agree on who the real "enemy" is. Is it Adam Tickell? Is it UUK? Ask students and they come up with different answers. I know who is behind these militants at Sussex (names I will not mention here) but it hardly surprises me as to who they are - I won't comment any further for fear of being accused of having too much to think libel action. And moreover, no striker has been able to answer the question of where the line is between appropriate action and inappropriate action. Is storming into a lecture (and in so doing, crossing your own picket line) appropriate? Is blockading public transport appropriate? Is bullying students who need to use campus for non-academic reasons (such as first years who live on it, or those requiring counselling, for example) for unavoidably crossing the picket line, even when they support you, appropriate? Is downright stupidity appropriate ("the library is crossing the picket line, study in Falmer House instead", but that's crossing the picket line too...)? No one seems able to answer these questions. I know the Student Union voted to support the strike action, but I do not think that condemning such militancy would be going against that mandate. I haven't decided on whether to endorse Frida Gustafsson for re-election yet: I feel she can be weak in a crisis, although I like the general direction she is taking the SU in. I feel she needs to condemn the militants. Now. Additionally, I feel that if more strikes go ahead, the policy should be up for re-vote as it would be for a different period of strike action. Students - even if you support these strikes, I urge you not to join in with the militants (Sussex Supports our Lecturers). This sort of behaviour is straight outta da winta of discontent. Innit. Professor Pope put to me on BBC Radio 5 that the UCU's report was done by an "independent body". No it wasn't. The report was commissioned and financed by the UCU and carried out by First Actuarial - a firm whose business model is to produce reports financed by the client. Naturally it's going to produce a report that its client wants to see. Why else does the Labour Party often commission reports from the TUC and the Conservatives from the CBI? Because they know they're going to get an answer they agree with. The figure quoted, that members will lose up to £200,000 in retirement, is quoted without any indication of the assumed level of investment return. This is not dissimilar to the "£350m for the NHS" figure that was contentious in Brexit - the figure is true, but only just if you include ALL benefits, not just pensions. The £200,000 figure is for a lecturer above £100k per annum on salary - a minority of lecturers. "Employers will pay less towards USS pensions." No they won't. UUK's proposals include a commitment to 18% employer contributions until March 2023. UCU claim UUK were over-represented in negotiations. The Joint Negotiating Committee, effectively arbitrating the negotiations, have made it clear this is a downright lie. The arrangements are up for discussion again in 2020, and are not fixed as UCU claims. Indeed, UUK have said they would like to reintroduce DB in these talks. UCU deny the claim that there is a deficit within USS. The Pensions Regulator and PWC have confirmed (independently, and I actually mean independently) that this is a lie, and the deficit does exist. And no, whilst it may not bankrupt people immediately, when you are short one week you have to economise the next. This is the reason for so-called "austerity". See the debt bombshell on the right-hand side of this page (unless you're viewing this on a mobile)? That's why the government have had to tackle their deficit. And so should USS. "Existing benefits already built up will be affected." Nope. These are protected by law, so cannot be changed. UCU's own proposals would mean a cut in take-home pay for its lecturers. 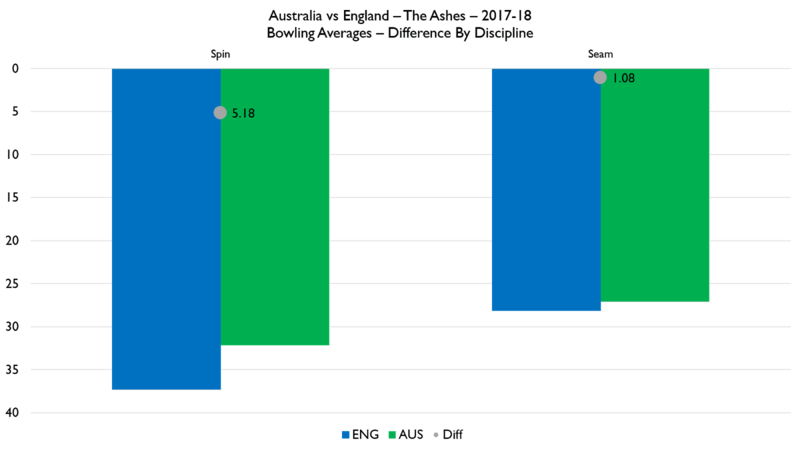 UCU's proposal is for employees to increase their contributions to the pension pot from 8% to 10.9%, a cut in accural rate from 1/75th to a bizarrely low 1/80th (1.25%), and employers to increase their contributions from 18% to 23.5%. Let's dismantle this policy. For a lecturer, this means their real take-home pay will be cut. If their salary is (say) £50,000, increasing the pension rate means more taken out of it (as per tax) before it reaches the wallet. Members will have to increase their contributions by 35%. Employers have had their contributions increased by 28.5% over the last 10 years by having their contributions increased by 4 percentage points over this time frame. To ask them to pay even more is unaffordable. Reducing the accural rate will mean fewer benefits for lecturers in retirement. This will add about £500m to the cost of pensions; Sussex alone, for example, will cost an extra £5.5m per year. So which is it, lecturers - pay cut or pensions cut? I hope this clarifies my position on these strikes. I hope all sides move on negotiations. We cannot go on like this - opportunistic militancy must stop. The competition of "second best T20 league in the world" (in terms of standard and competition) is wide open (the IPL obviously being the best considering it's the only one that Indian players play in thanks to the BCCI). 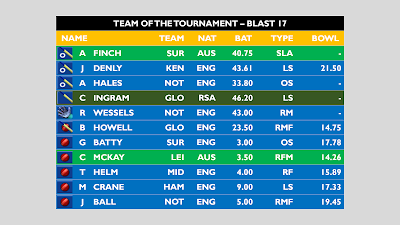 I did have the BBL second, but after this year I think it's now third, the English T20 Blast having overtaken it. International call-ups really hindered this year's BBL. 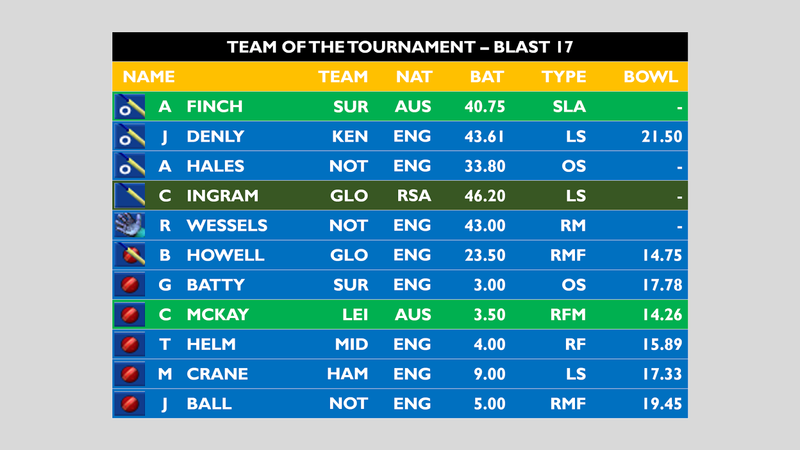 Nonetheless, as I did for the Blast (albeit only on Twitter), my team of the tournament for #BBL07 is to be revealed posthaste. The balance of my team will be my "standard" balance for a limited-overs team, i.e. the balance I would like to have in normal conditions (although I would like to think it covers all locations around the world): 5 batsmen (including the 'keeper), 2 spinners, and 4 seamers. We're not adhering to any overseas restrictions here, either. A vintage year for some opening batsmen, with the three centuries in this year's tournament all by openers. For others, it was a major disappointment - Jason Roy was very lucky to get an IPL contract. D'Arcy Short picks himself, but the choice between Alex Carey and Jake Weatherald is tough. For now I'll pick Weatherald, as Carey might return to the fray in the keeping debate. Weatherald's more defensive style is also a good counterpoint to Short, and I would want him to bat through the innings. Although Short can bowl, his figures don't justify inclusion as a bowler, so for me he plays as a specialist batsman. Numbers 3 and 4 are a bit difficult. Chris Lynn was plagued by injury and only faced 91 balls in the entire tournament, so to be dismissed every 23 balls is not ideal, even with his Lynnsane strike rate. His replacement, Sean Heazlett, was nothing short of terrible. None of the candidates stand out particularly, aside from Cameron White and Tom Cooper, both from Melbourne Renegades. White averaged 76, although this is down to 4 not outs from 8 innings, and Tom Cooper averaged just under 50. Shane Watson and Travis Head are the other candidates; picking two from White, Cooper, Lynn, Watson, and Head is difficult. Ultimately, I can't give the spot to Lynn, and finding an argument for Cooper is also incredibly hard to come by. White's got #3 sown up, so is it Head or Watson for #4? Should I pick Head now and worry about Watson when I come to the bowling? No, because Watson is a batting all-rounder who only took 3 wickets at 56 each in the entire tournament, so I wouldn't even consider Watson on bowling grounds. Like with the openers, I'll go with the player that's the biggest foil to White. Ultimately, that has to be the more aggressive player, and with more 4s, 6s, and a higher strike rate, it has to be Shane Watson. No debate here at all. Alex Carey. More than double the runs of the next-best keeper, Matthew Wade. Powerplay spin bowling was the "must-have" craze of the Big Bash this year. Some were better at it than others. Whilst bowling the first over with a flatter, quicker spin bowler has been a technique used for many years around the world - and a successful one at that - it hasn't been the case where spinners have bowled all through the powerplay. With that in mind, do I want one spinner who could bowl in that powerplay? Or I would I rather them choke the opposition in the middle overs (a technique perfected by Gareth Batty and Mason Crane in the Blast, not coincidentally my spinners in that TotT)? Regardless, one of the picks will be Rashid Khan of Adelaide and Afghanistan, and incidentally the first overseas player of the team. The second spinner, however, could have been a major issue, but ultimately you have to follow the numbers. 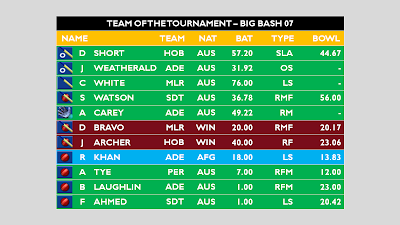 Only two spinners took 10 or more wickets in the BBL - Khan and Fawad Ahmed, so I cannot overlook Ahmed. His economy rate is also exceptional. 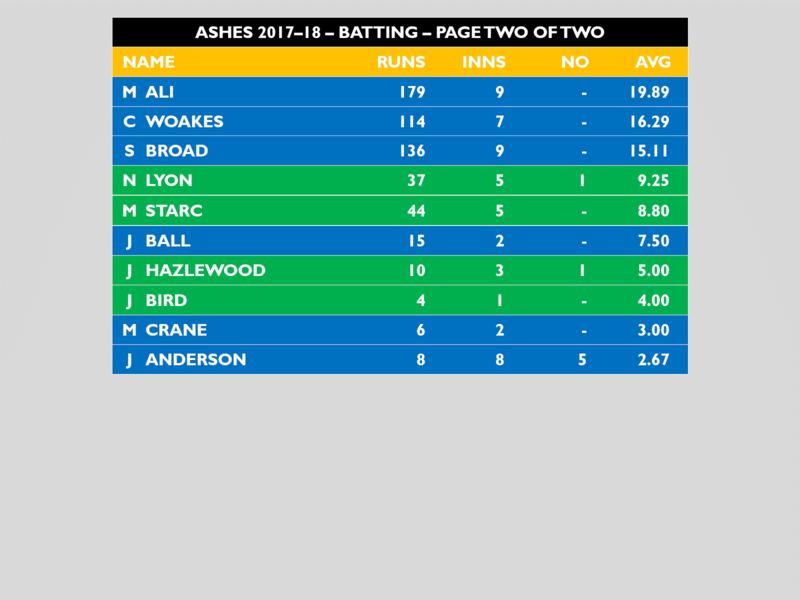 "So is Ashton Agar's", I hear you cry, but his strike rate isn't that great: 26.25 compared to Ahmed's 20. So I'd bowl both my spinners in the middle overs. They're economical, plus they take wickets. For comparison, my Team of the Blast is below. It's fascinating how there's no alignment between the two sides despite several playing in both competitions, and it would be fascinating to see who comes out on top in a game between them. It's also fascinating how 3 of each team are overseas and 8 are non-overseas. Please. Stop. The. Mark. Wood. Hype. Train. England have struggled to find a third seamer. It was the only place available in 2010. England are still looking for a third seamer. Jake, Tom, Toby, and other Chris. I didn't mention Mark, England like him best. He's always injured, never fit. Anyway, I digress. In his career he averages 41 in test cricket. Last year he leaked 197 for just 1 wicket. After all, he'll bowl it at the Kiwis' head. Or let's pick Mills, and bowl 2-over spells. He'll win in New Zealand, let's sound the church bells. I don't think Mark Wood should play in tests. If he leaks again, we'll be in a mess. Speed isn't everything after all, you know. Consistency makes for a much better show. Bowling total crap made Ricky Ponting frown. 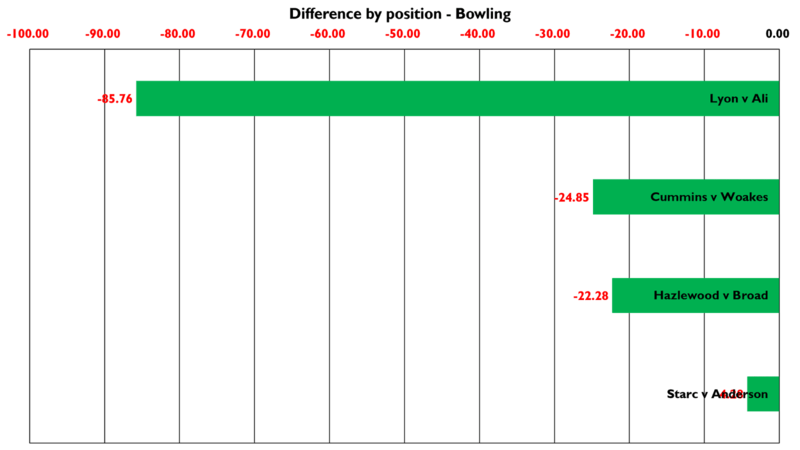 Therefore, the Wood hype train needs to be stopped. I think the selectors, when babies, on their heads, were dropped. 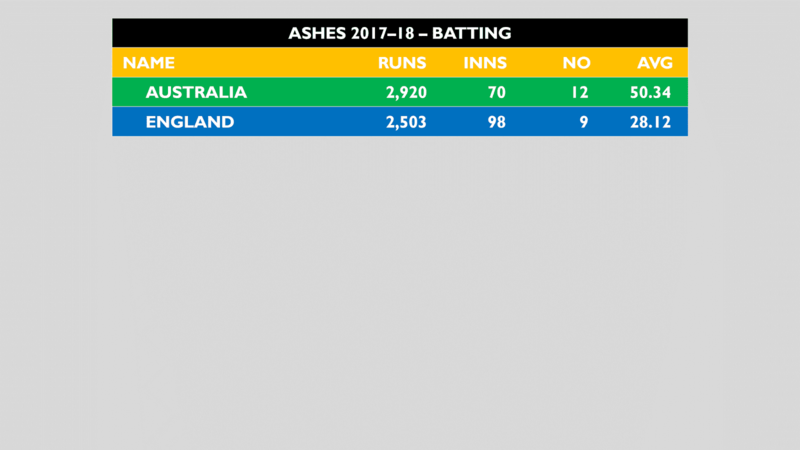 2017-18 Ashes Review - I Told You So! "The fault really lies with the bowlers, with Cook's terrible (mis)management of them, and [his management of] Batty in particular." Now, Cook and Batty are out of the way (solving those problems), but exactly the same thing has happened again. England have put good first innings totals on the board, and the bowling has let them down. I said England's strength was its seam bowling, and at times they stood up and did their jobs - Adelaide in the second innings springs to mind. 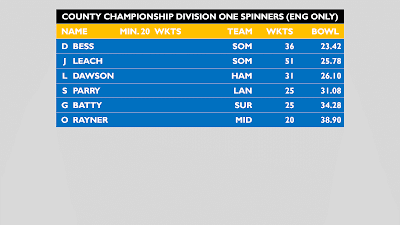 The more worrying disparity is between the spin bowlers (just as I expected). Another year and it's another poor tour for Moeen Ali. 5 wickets at 115 really should kill off his England test career. This disastrous series is even worse than his tour of India last year (10 wickets at 65) and he is quickly becoming a home track bunny, even more so than the likes of Anderson and Broad. The three main seam bowlers of Anderson, Broad, and Woakes just about put their heads above water, but it all seemed to not come at the right time. Anderson was, in my opinion, England's best player on the tour. He would be very unlucky to not make it into a combined XI. But he cannot be expected to do it all the time for England, and it speaks volumes that England failed to take 20 Australian wickets once in the series (mind you, they only did this once against India last year as well). I'm not sure Trevor Bayliss is the right man to lead England forward in test matches overseas, as a result. 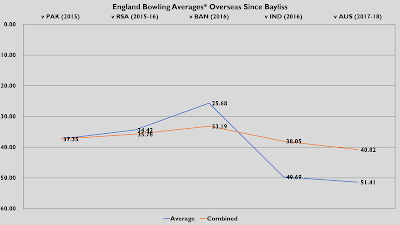 As you can see from this graph, our bowling average overseas started poorly and is just getting worse and worse (a low-scoring series vs Bangladesh notwithstanding). 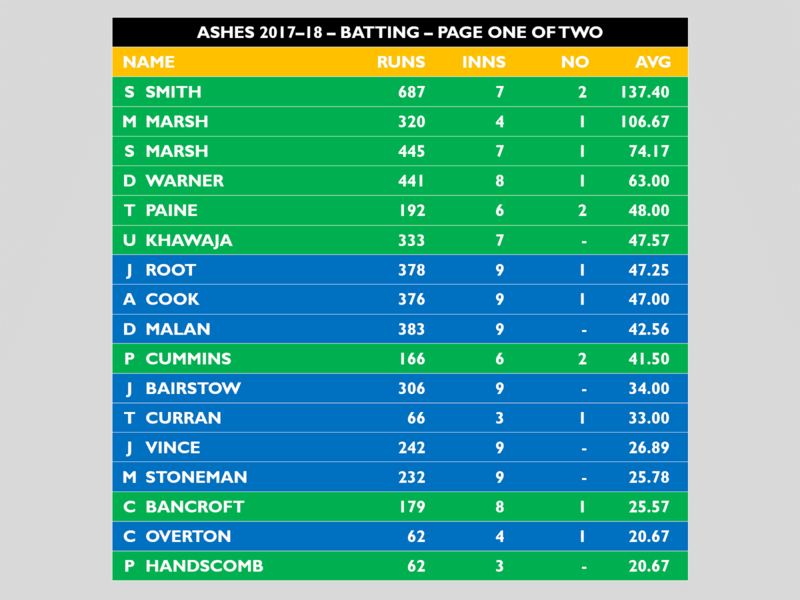 Here are the batting figures overall, and then we'll move on to more "I told you so", then we'll talk about who I'd pick against New Zealand. Using the same criteria I used to give a very rough prediction of the team's scores, that same calculation gives Aus 567, Eng 298. 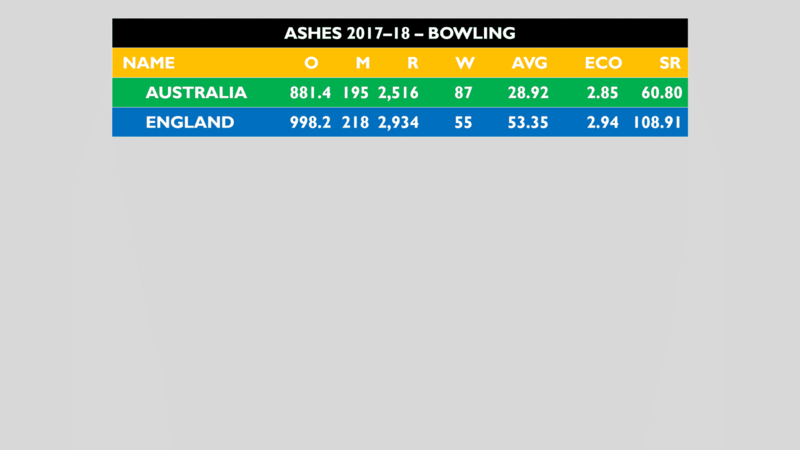 I wasn't far off on the England figure, but Australia's figure was way above the 365 I suggested. If we assume there are 16 spots available, who goes? Who stays? And who goes home? I would retain Cook and Stoneman at the top - Stoneman has been unlucky and hasn't shown a major technical flaw as Bancroft and Vince have. Additionally, the next cab off the rank in terms of openers could well by Stoneman's team mate at Surrey, Rory Burns, and I'd take Rocky over Burnsy any day. I namechecked Vince, and yep, Vince goes home for me. His technical flaw is too disastrous to persist with. Rather than go shooting in the dark for number three again, I'd rather have Root bite the bullet and go up there himself. After all, that's where Williamson will be. I would have Malan at 4, and I'm going to bang the drum again for Steven Davies at 5. He's scored runs year after year after year for Surrey and now Somerset, even scoring just shy of 800 for the season on those Taunton Bunsen burners. Ben Stokes, if eligible, plays at 6. Jonny Bairstow should be retained at 7. The next one is a bit of a major climbdown for England, but I really feel they have no other alternative than to go back to Adil Rashid at 8. That allows for Roland-Jones (if fit) at 9, Broad at 10, and Anderson at 11. That's a fairly realistic selection, Davies aside. 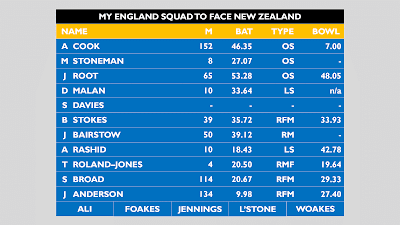 If I had a completely free rein I would play 4 bowlers, and leave Roland-Jones out for an extra batsman (Foakes?). As for the 5 that would fly but I wouldn't start them: Liam Livingstone, Keaton Jennings, Ben Foakes, Moeen Ali, and Chris Woakes. Potentially get rid of Livingstone for another seamer, but I'd be happy with that selection. Now, away from the coverage, on the field, what on earth is going to happen to England whilst missing the second name on their team sheet, Ben Stokes? 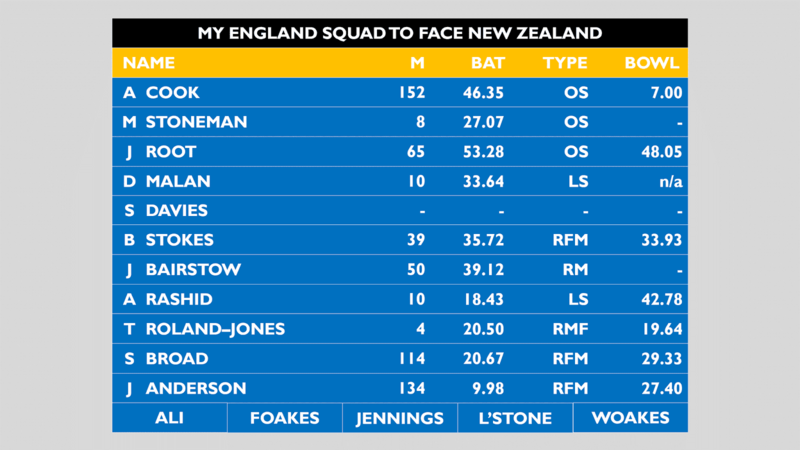 I have maintained that Stokes is good enough for England to only need 3 seam bowlers and 1 spinner (although Ali may not be good enough to tie an end up, but we'll get to that later). I have also maintained that England should fly Stokes out now and deal with the recriminations and deportations later. Everyone seems to have forgotten that David Warner's assault of Joe Root in 2013 lead to him missing only two tests and a couple of ODIs. Stokes looks unlikely to play in the entire tour of Australia and New Zealand - that's 7 tests, 12 ODIs (including the two he missed against the West Indies), and 4 or 5 T20Is. Whatever happened to "innocent until proven guilty"? Rather than replace Stokes with another all-rounder, England think the bowling is more important so it looks likely he will be replaced by Craig Overton of Somerset. 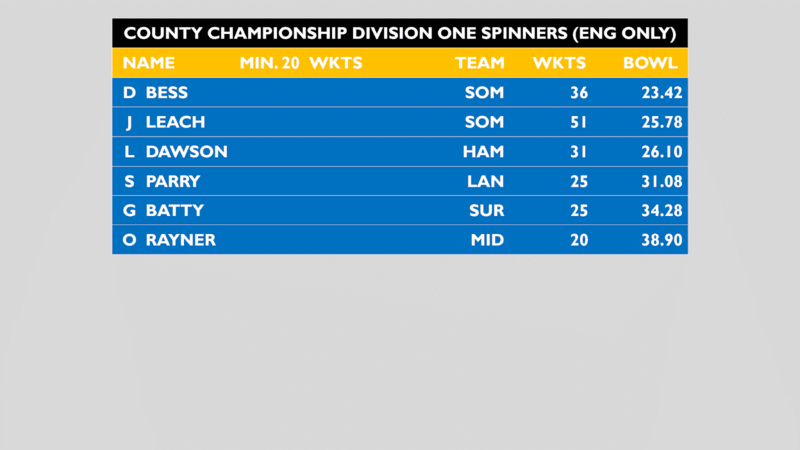 The injury scenario is ludicrous anyway, and the mere fact that Yorkshire's Liam Plunkett is at least 12th in the England seam bowler pecking order is a joke. You can argue about the order of the top 10 all you like, but the fact remains that James Anderson, Stuart Broad, Ben Stokes, Toby Roland-Jones, Chris Woakes, Mark Wood, Jake Ball, Craig Overton, Steven Finn, Tom Curran, and George Garton have all been preferred to Plunkett. That is a joke. Mind you, England's injury situation, invoking memories of 2002-03, is no better. 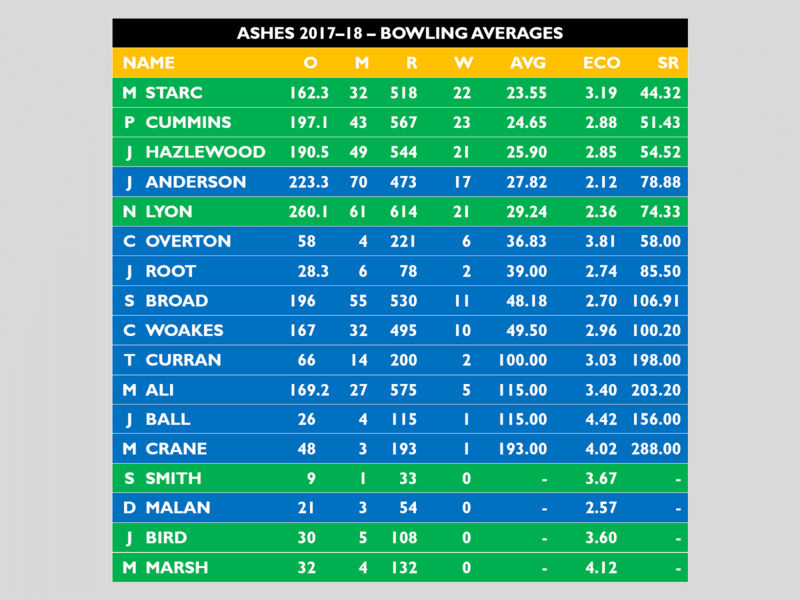 Ignoring Stokes for a moment, our 4th, 6th, and 9th choice seam bowlers are all injured, as is #7, Ball, but unlike the others, he hasn't flown home. I haven't even mentioned the spinners or the batting yet, so let's get a move on. Let's start with the batting. 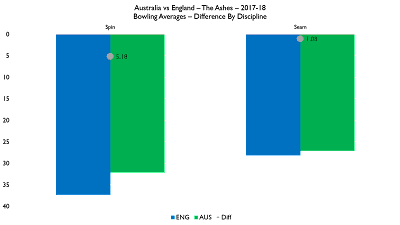 England have still failed to learn the lessons of 2013-14, not least because there is no shortage of bad decisions having been made since then with relation to the batting. England still haven't solved the problem of who bats alongside Alastair Cook even though this problem has now existed for over five years since the retirement of Andrew Strauss. Nick Compton, Joe Root, Michael Carberry, Sam Robson, Jonathan Trott, Adam Lyth, Moeen Ali, Alex Hales, Ben Duckett, Haseeb Hameed, Keaton Jennings, and now Mark Stoneman have all had a go (prior to Strauss's retirement, Cook had also opened with Michael Vaughan, Kevin Pietersen, and (obviously) Strauss). Bizarre decisions were made in the aftermath of that tour, some of which England are having to still contend with. England's three leading run-scorers on that tour (Carberry, Pietersen, and Stokes) found themselves dropped - Stokes later made his way back, whilst Pietersen retired from English cricket this year. As for Carberry... it looks like he's unlikely to return, but you can never tell with England. As it is, England have opted for Stoneman on the tour with Cook, and Stoneman will have to do what none of the other openers did - not just hit one huge innings in the first couple of tests and then fail for the next few. So who comes in at #3, an even more important position now that the openers are as stable as block of jelly? 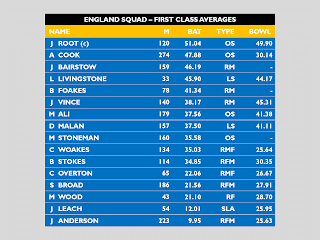 Joe Root, for the most part, held that role in 2013-14. Root had a miserable tour in 2013-14, his heavy bat proving just as much of an issue as his heavy feet. Now, as captain, he's put his ego ahead of the team's interests. 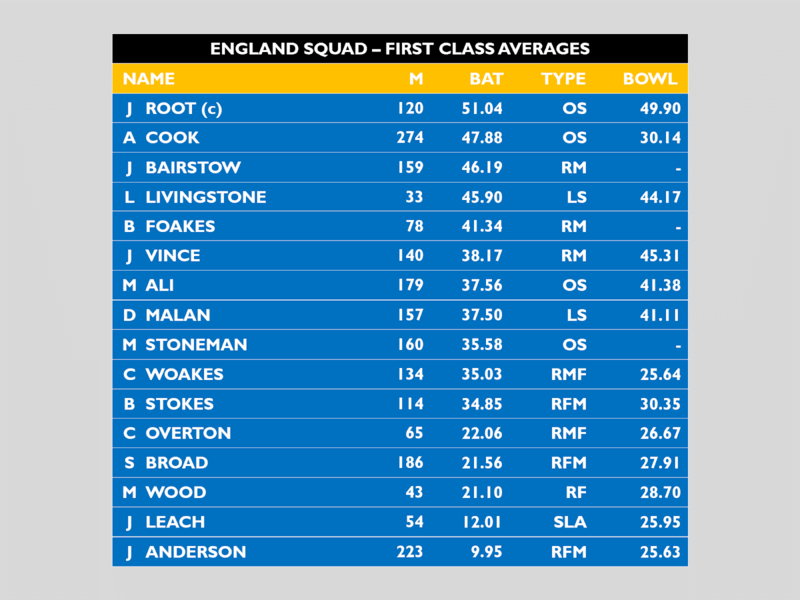 Only last year Root hit 254 against Pakistan at #3, but now he refuses to bat there (in sheer contrast to my favourite England captain Vaughan, who batted up and down the order as captain, even batting at #4 to shoehorn in Marcus Trescothick, Strauss, and Cook). Even if Root refuses to bat there, England could do far worse than Moeen Ali, although they still can't work out what they want from him. It's clear that Ali is a batting all-rounder, and I retain my belief (for now) that he shouldn't be England's main spinner. He had one good series this summer - indeed, I was at The Oval for the hat trick - but one swallow doesn't make a summer. Only a good winter will finally convince me to him. No, number three looks likely to be held by James Vince, and I just can't work out why. 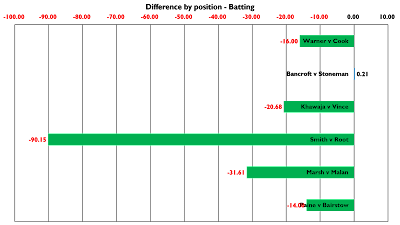 England's bowling selectors appear to be on a different page to the batting ones, as the batting ones just follow the County Championship statistics irrespective of any mitigating circumstances whatsoever. This is why Gary Ballance is constantly picked, because he scores county runs but can't get forward enough at test level. Vince, meanwhile, constantly wafts outside off stump and gets away with it in county cricket but was found out time and time again at test level. Bizarrely, in picking James Vince, England have picked a batsman who has a worse batting average - batting average - than Ashley Giles, the "King of Spain". Amazingly, Vince and Ballance are both on the tour. I talked about England's wheel-of-fortune approach to the batting, but Dawid Malan is a bizarre exception. He did well in a T20I once and that was enough to convince Trevor Bayliss to encourage him for Test selection. Do I even have to explain how ridiculous that is? For starters, it's a great argument for Jason Roy's selection. Jonny Bairstow and Ben Foakes are obvious choices for wicket keeper and not much needs to be said about them, other than the fact that had England picked Jos Buttler I would have been incensed considering he doesn't even play in the County Championship. At all. No, what does need talking about is the second spinner. Mason Crane. Just... why? How? Consider the fact that he can't even get a game for Hampshire - Liam Dawson is keeping him out of the team - why is he above Liam Dawson in the England rankings? Dawson has been tried (and failed), so what on earth is going on? There are approximately 10 spin bowlers with a better claim than Mason Crane to that seat on the aeroplane, and only two of them are going (Ali, Root). Did Adil Rashid run over a selector or something? All in all, England's seam bowling attack of Anderson, Broad, and Woakes (and possibly Overton if they pick another seamer) is their strength. Their weakness? Their shaky batting, particularly at #3 and #5. Likely England XI for The Gabba: A Cook, M Stoneman, J Vince, J Root (c), D Malan, J Bairstow (wk), M Ali, C Woakes, C Overton, S Broad, J Anderson. Other squad members: J Ball, G Ballance, M Crane, T Curran, B Foakes, G Garton. By contrast, the Australians have had it fairly easy-going, but a number of questions still remain. There's really not a lot to talk about with Australia apart from the obvious question I'll come on to in a moment, but I'll start by just briefly covering the 9 dead certs to start at The Gabba (barring injury). The "pocket rocket", David Warner, used 2013-14 to burst onto the scene and announce himself as a batsman here to stay. Along with Alastair Cook, he is one the best openers in the world and slides into my world XI. Matt Renshaw looks certain to start alongside him. Born in Middlesbrough, Renshaw's statistics indicate a player who starts well but doesn't score nearly as many 50s or 100s as one would expect with an average of 36.64 in 10 test matches - just the one century and three 50s. This series will make or break him. 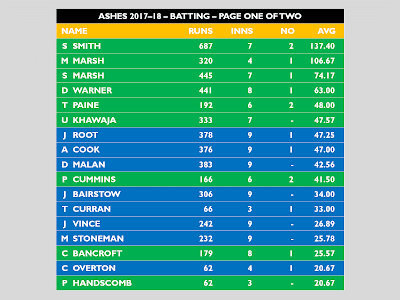 With Steve Smith inked in at four, at number three will be the new and improved version of Usman Khawaja. Since the last Ashes series in 2015 (which he didn't play in) he has scored 5 test centuries and looks to be frightening. However, he was left out of the Australians' series against India (which ended 2-1 to India although, being India, the BCCI kicked up a fuss anyway). Additionally, in his only test since January, against Bangladesh in Dhaka, he was dismissed for 1. Twice. His Ashes legacy remains copping a howler from the third umpire at Old Trafford - this is an unbelievable opportunity to not just be "the bloke who was given out". 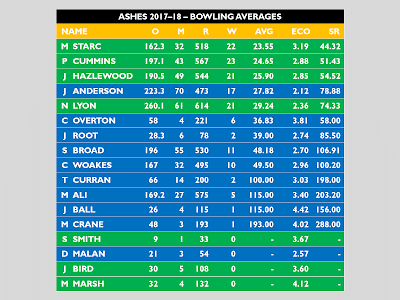 As for the bowlers, Mitchell Starc, Josh Hazlewood, and Pat Cummins will provide pace (although not much variety). Starc can swing the ball and if he gets the pink new ball moving in Adelaide, he will have England at 5 down for not a lot by the time the lights come on. The pink ball tends to do a fair bit early on and then gets smacked around the park, so the first few overs of each innings in Adelaide will be crucial. Nathan Lyon is arguably the world's greatest spin bowler and, barring something extraordinary from Ali, Lyon is going to make him look very ordinary. Now this is where things get a bit tricky. Who bats at 5, 6, and 7? And who keeps? Peter Handscomb looks likely to bat, but should he keep? And if he keeps, should he bat at 5 or 7? And if he bats at 5, does that mean you have the odd situation of a specialist batsman at 7? Well, whilst I would do things differently, the answers look to be the following: Handscomb 5, Glenn Maxwell 6, Matthew Wade 7; Wade; no; n/a; n/a. 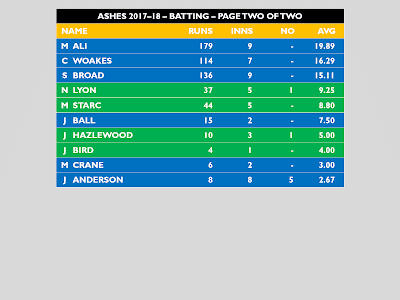 Wade's batting looks more messy than a wildebeest in a lion den, but somehow I get the feeling he will be retained at 7. 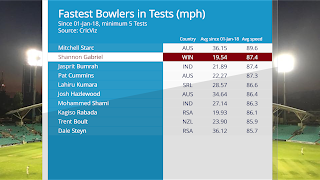 Glenn Maxwell will surely bat at #6, although I wonder if the Australians would prefer Surrey's Mitch Marsh in there considering he bowls seam rather than spin. Australian all-rounders seem to be batting all-rounders - I can't remember the last time Australia had a genuine all-rounder. Some other names have been floated around (Hilton Cartwright, Marcus Stoinis), but I can't look past Maxwell for #6. Mind you, I don't think we'll truly know who bats there until their team for The Gabba is announced. Likely Australia XI for The Gabba: D Warner, M Renshaw, U Khawaja, S Smith (c), P Handscomb, G Maxwell, M Wade (wk), M Starc, P Cummins, J Hazlewood, N Lyon. Australia. 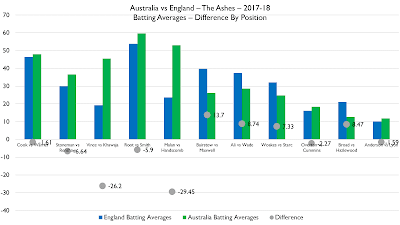 As can be seen from this chart below, the Australian batsmen hold a superior advantage in terms of their statistics compared to their English counterparts. 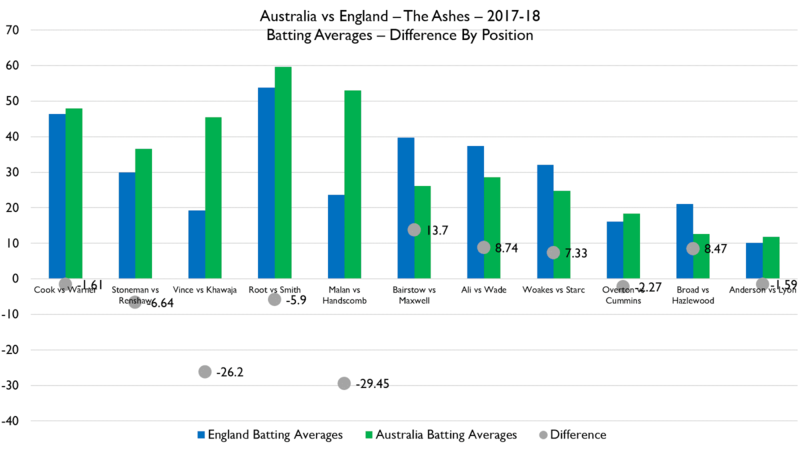 Summing the averages of each team, the Australians, if they all hit their batting averages exactly, should score 365, compared to England's 330. 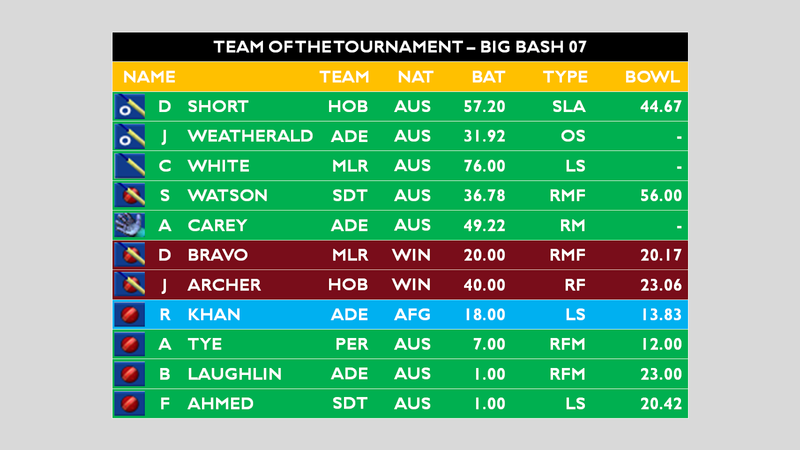 As you can see from the chart, all of the 5 Australian top order batsmen have a superior batting average compared to their opposite numbers. England's weak points at 3 and 5 show up here. 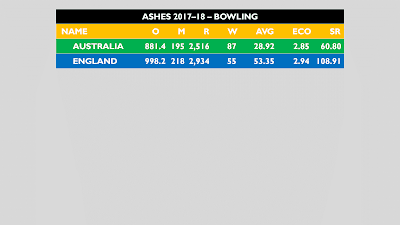 Lyon and Maxwell (combined) have a far better record than Ali, as do (just) the Australian seamers in relation to their English counterparts. Predicting the scores is a lot harder to do as we won't know in advance how the captains use their bowlers, but we can tell you that on these figures England would score somewhere between 253 and 462. As Maxwell's unlikely to bowl too much, expect this to be near enough to the England batting prediction of 330. 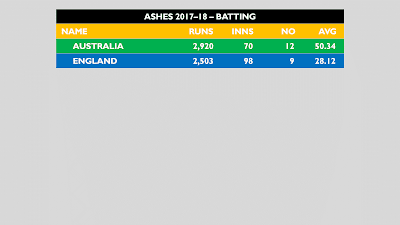 Australia, meanwhile, on these figures, would score between 274 and 373, but as I say, take that with caution as we obviously don't know how well Craig Overton will do. So, England have worse bowlers and worse batsmen. Start the car. I won't say 5-0 because you can never rule out raining out a test (although only one Ashes test in Australia this century has been a draw), I expect Australia to win to nil. 10 REASONS WHY DOMESTIC CRICKET IS BETTER THAN DOMESTIC FOOTBALL - NUMBER 4 WILL SHOCK YOU!!! Yesterday I saw Surrey's captain, Gareth Batty - "hey mate", he said, "how ya doing?" "Yeah, I'm good, how about you?" "Yeah, I haven't seen you for a while." "Ah, I'm normally Pavilion Top." Gareth and I first met in April, when I went to his quiz night that he was doing for his testimonial year, even asking some of the questions himself and conducting the raffle (in only a way Gareth Batty can). By contrast, an evening with Fulham captain Tom Cairney would probably cost about 10 times as much and probably wouldn't be as much fun. All the grounds in England like to think of themselves as grounds, not stadia, even Lord's (28,500) and The Kia Oval (26,000). The atmosphere, as a result, feels like you're at home, as opposed to football stadia, where, make no mistake, you're in a hostile environment. I attended 7 T20 matches at The Kia Oval. The only spot of crowd segregation was for the quarter final (and even this was not deliberate but merely the way the tickets were sold). With over 23,000 people for all but 2 of Surrey's 8 home games, the only spot of crowd trouble (streakers aside) was a minor scuffle in Block 18. Whether Surrey lost or won, everyone had a good time. No, this isn't something to do with Brexit, this is a rule that has been around for many years to attempt to encourage English cricketers. 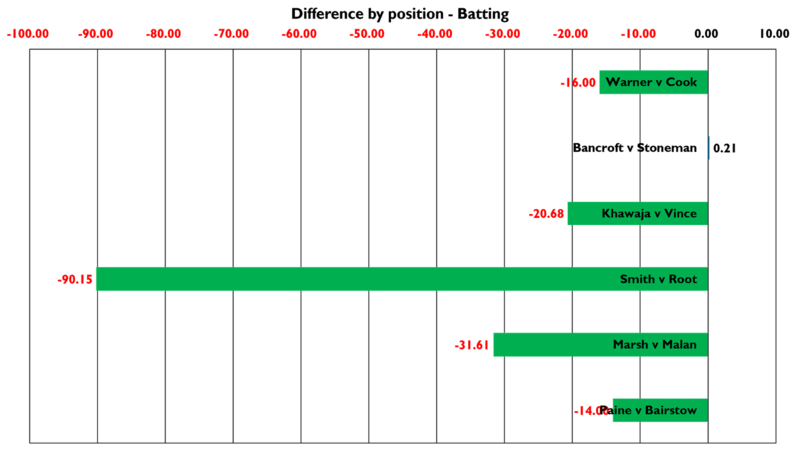 Teams can only sign one overseas player (and a reserve should he get injured) per season, and thus can only play one overseas player in their XI. T20 is slightly different in that in addition to your main overseas player you can sign two more T20-only overseas players, but only 2 of the 3 can play. This encourages English players and if it were to be adopted in football would finally cure some of the problems in the ill-fated England national team. Called up for England? Well, your county will just have to manage without you. England's schedule is far too busy to stop domestic cricket, and it carries on without the "star" players. It also encourages depth of squads and youth players. Cricket's home advantage is more than that of football's. In cricket, one can doctor the pitch to conditions that suit your team. For example, English pitches are generally helpful for swing bowlers and you would play 1 or even 0 spin bowlers, whereas Bangladeshi pitches hardly ever seam or swing, and you need at least 3 spinners. Consequently, all 18 English domestic teams are expected to win at their home ground. With the advent of T20 in 2003 came a change in attitude to fielding. Every run counts. Players dive around, pulling off sensational stops and catches to the point where they have almost become routine. Players leaping over the rope for example to parry the ball up in the air (without touching the ground outside the rope and the ball simultaneously) and then darting back inside the field to complete the catch. 9 - Bend it like Beckham? No, swing it like Sohail. David Beckham's curling of the football whilst airborne became legendary. In cricket, however, this is normal. The best swing bowler in the world is arguably James Anderson, who swings the ball by more degrees routinely. A ball could be heading down one side of the stumps and then swing and miss the other side completely. The best international batsmen in the world can't deal with it. And whenever swing bowlers are on fire, it's a joy to behold. 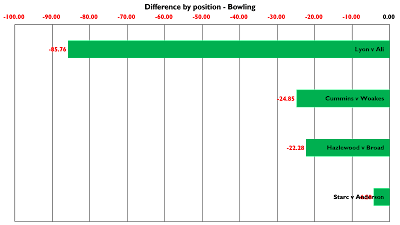 Whether they're in Division One or Division Two, the differences between the teams are often so minimal that teams can be promoted from Division Two and then win the Division One title the following year - look at Essex this year, who, having won Division Two, are about to win Division One the following year. By contrast, the media hype surrounding Leicester City merely goes to show the vice-like grip the top teams normally have on the Premier League. Basically, anyone can win. Let's go through these annotations one at a time. The red dashed line provides the line of offside. Under new rules, Michael Madl's head doesn't count as playing Harrison on, and it's very, very slight as to whether Harrison's body (note: not his arms or head) is offside. 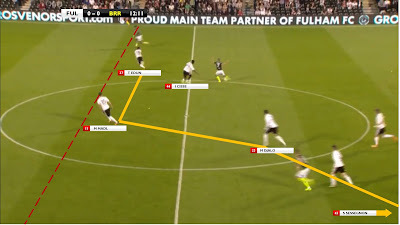 The more worrying thing to look at, however, is the positioning of the 4 defenders, connected by the solid yellow line. It's embarrassingly bad. Djalo's about 10 yards too high, meaning Edun's slot in at CB, and I'm not sure if Cisse's meant to be doing the same thing. 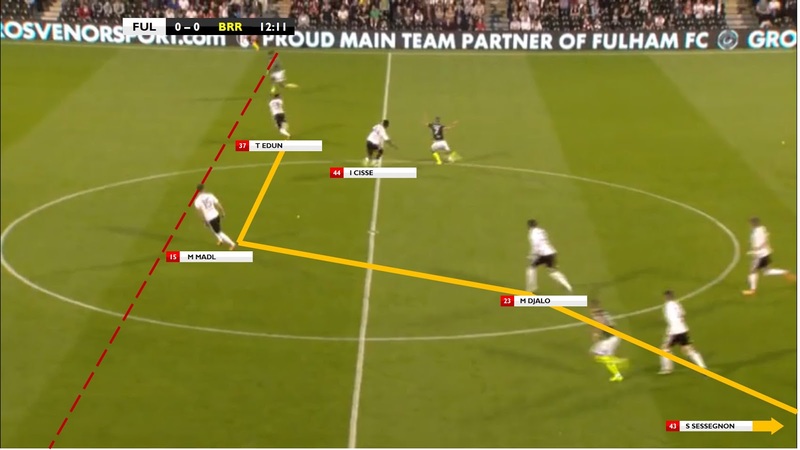 The RB, Steven Sessegnon, is not even in the frame. These tactics of playing such a high line do not work with the defensive line as haphazard as it is. Sort it out, Slav. This is why so-called "austerity" is not a choice, but a necessity. What caused Ayrton Senna's death? Da da da da da-da-da-da BOOM! The Psephology - Why Did Leave Win? Text and design work is that of Rhys Benjamin unless otherwise stated. Awesome Inc. theme. Powered by Blogger.